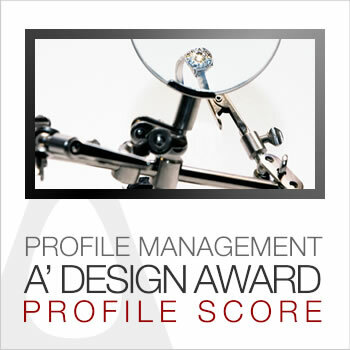 This page describes the profile score and profile ranking mechanism for A' Design Award. What is a Profile Score? When you create a profile at A’ Design Award & Competition, you are asked to provide information about yourself as a designer, artists, architect, engineer or creator of the project. The information you provide for your profile at A’ Design Award & Competition is used to improve your press appearances for both traditional and online publications, is included in your press-kits, used to provide you additional services such as mediation, consultancy and communicated to media as well as used to improve the search engine visibility for your profile. In summary, the more information you provide, the more publicity and visibility we could provide for you. Thus to push participants complete their profile we created the “Profile Score” mechanism which creates incentives for you to complete your profile. How does a high Profile Score help me? Effect on platforms: For publicity and dissemination platforms such as the World Design Index, Design Legends, Best Designers list etc., a higher Profile Scores ensure your profile to be displayed before other entries with a lower profile score. Effect on designer rankings: A higher profile score could potentially increase your designer rankings, within the score range: For example if there are 5 designers with the same score, we rank designers with the same score based on their Profile Score. Please note that the Profile Score does not effect the overall ranking, but sub rankings when score of several designers are the same. Completing your profile over 95% at A' Design Awards will grant you a complete profile badge. This badge/status will ensure your name is listed before all other participants keeping everything else constant. You can learn about A' Design Award Badges. Which Information Effects the Profile Score and How to Increase It? You can increase the Profile Score by filling and completing your profile at your Control Panel. The more information you provide the higher your profile score will be. The following inputs increase the Profile Score: Name, Surname, Email, Country, City, State, Street, Zip, Phone, Organization, Discipline, Occupation, Job Function, Job Description, Gender, Birthdate, City of birth, Nationality, Website, Portfolio URL, Education, Experience, Private Exhibitions, Mixed Exhibitions, Events, Awards, Press Appearances, Academic Publications, Books, Accolades, Language Skills, Computer Literacy, Course & Workshops, Symposiums, Memberships, Collections, Jury Membership, Hobbies, Clientele, Statement of Art, Representation, Job Indications, RSS URL, Invoice Address, Invoice Country, Invoice TAX or VAT Code, Invoice Company Name, Account Views (Number of times your profile is displayed), Account Status (Active or Disabled), Job Title, Open Hour & Close Hour for your Business, GMT - Timezone, Postal Address, Unsubscribed, Listofnet Profile, Language Setting, Boilerplate for Press, Account Type. When will my score be updated? Each time your profile is viewed, the Profile Score is updated. To update your score, after filling in your details, view your own profile. Register today for Free, Upload your Design for Free, Get a Free Preliminary Score.